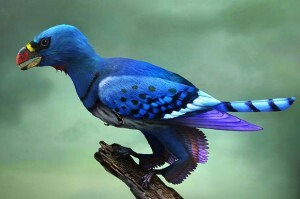 An artist’s reconstruction of the basal bird Sapeornis. Courtesy of Yike Xu, history.com. A fossil specimen of the basal bird Sapeornis. This fossil shows excellent preservation of the bird’s leg feathers, as shown in the close-up photographs (C, D). Courtesy of Zheng et al., 2013. The bird specimens come from at least four different basal bird groups, indicating that these hind wings were widespread in early birds, although they did not persist to modern birds. The scientists propose that the characteristic is the ancestral condition of birds. 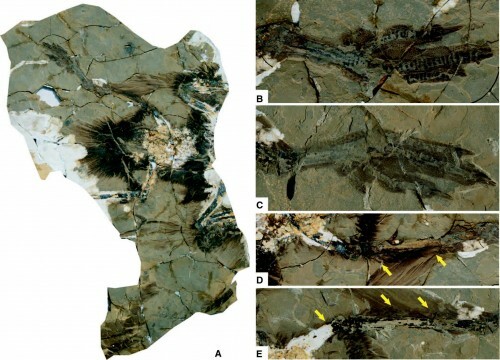 Following further investigation of the specimens and other feathered dinosaur specimens, researcher Xiaoting Zheng and colleagues found that these characteristic leg and foot feathers first arose in dinosaurs, possibly even in coelurosaurians (such as Tyrannosaurus rex). Later on, these distinct feathers disappeared in birds — first from their feet and then from their legs, leaving modern birds with only one set of wings. A fossil specimen of the basal ornithuromorph Yanornis. As shown in B-D, this bird has lost its foot feathers but still maintains its legs feathers. Courtesy of Zheng et al., 2013. Other scientists disagree. Richard Prum of Yale University proposes that the feathers may have served a different role, such as in courtship displays. Kevin Padian of the University of California, Berkeley, told Science that these feathers may have even made it harder to fly, due to their apparent large surface area. The scientists behind the discovery have thousands of other specimens, which should help resolve the conundrum. 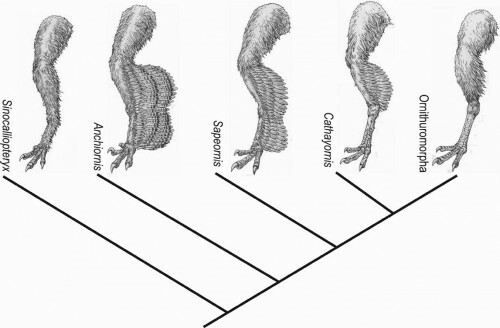 This evolutionary tree shows the changes of hind limb feathers over avian evolution. Sinocalliopteryx possesses short filamentous feathers covering the legs and feet. Anchiornis and Sapeornis (see graphics 1 and 2) possess large winglike feathers on the legs and feet. 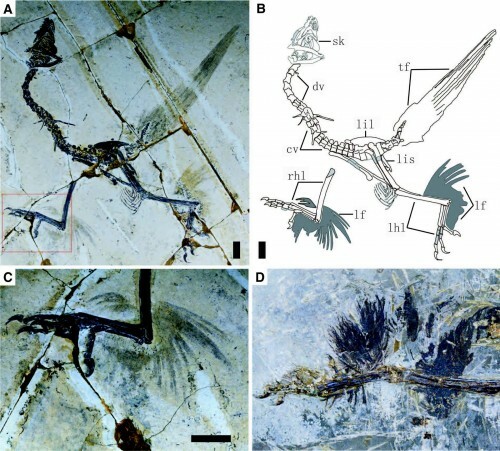 Cathayornis possesses large winglike feathers only on their upper legs, and Ornithuromorphs (see graphic 3) possess much smaller feathers also only on their upper hind limbs. Courtesy of Zheng et al., 2013.